he committee of Loughshinny & District Development Association welcome you to our Millennium Historical Walk. We have designed the walk into three routes, of equal length, 3.5 km each. Depending on how energetic you feel, you can do it in one stage or three. Route one will take you around the village itself, while routes two and three will take you around the district. Traditionally a fishing and market garden area, Loughshinny nestles midway between the towns of Skerries and Rush in Fingal north county Dublin, Ireland. The village retains a uniqueness of its own, with a picturesque working harbour. Many films have been made here, because of the beauty of the area and the co-operation of the villagers. The residents many of whom can trace their ancestors back for generations are friendly and welcoming. Since 1994 the village has an official 'Twinning' with the French village of Quistinic in Morbihan, Brittany. The Delahide coat of arms was revived and is adopted as the symbol of Loughshinny for official twinning purposes. 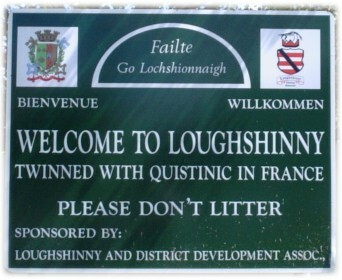 (The Norman Delahide family owned Loughshinny up to the second half of the 17th century). This walk that encompasses the whole area of Loughshinny, becomes more interesting because of the historic events that took place over the centuries here. From love, wealth, war, tragedies, murder, not to mention the breathtaking scenery, this walk has all the ingredients of a blockbuster novel, which instead of sitting back and reading it, you can participate in it at your leisure. We hope you find this of interest. Our gratitude to the Committee, The Historical Society, Fingal County Council, The Leader Company and The Millennium Committee, without whose help this project would not have been completed. Loughshinny Historical Millennium Walk is the inspiration of the Loughshinny & District Development Association.The Loughshiny & District Development Association committee would like to express their sincere gratitude to Fingal County Council Environment Department and Parks Department, also local landowners all of whom kindly allowed us to erect Limestone Plaques on their land to mark the events along the route. We would also like to thank all the members of the community for all their help in completing this project. C. Coghlan, M. Bentley, A. Fagan, C. Butler, J. Kenny, M. Markey, D. Donegan, C. Plunkett, D. Courtney, B. Gibson, M. McCabe (R.I.P. ), M. English, M. Johnson, N. Pender, S. O'Toole, A. Hughes, E. Kenny, E. Russell.